Transfer cart is a kind of cost-effective, safe and flexible material handling cart widely used in fabrication shops, warehouses, metallurgical plants, etc. for load transportation. 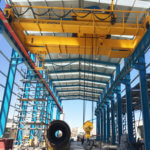 It can also cooperate with overhead and gantry cranes in the workshop to transport heavy loads across the bridge. Transfer carts are simple devices that operate on floors and do not requires complex or permanent installation. We offer KP series electric transfer cart that runs on rail and trackless transfer cart to meet your precise requirements. 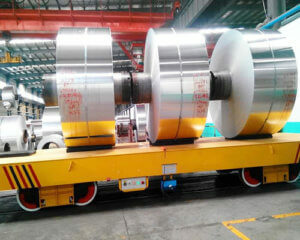 Load capacity: 2-150t; power source: rail; application: fabrication shops, steel plants, warehouses, chemical plants, etc. 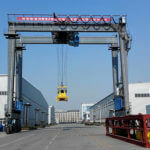 This type of material handling cart is powered by the rails. It is ideal for heavy load, high frequency of use and long distance transportation demand. It has many features, such as safety, flexibility, long service life and no distance limit. This cart can be operating in S-tracks or curved tracks. The rails should be insulated. If the running distance exceeds 70m, more transformers are required to compensate for pressure drop of the track. 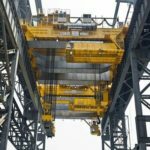 In addition, a hydraulic lifting system can be installed on the device if needed. You can choose from single phase and three phase low-voltage power supply. 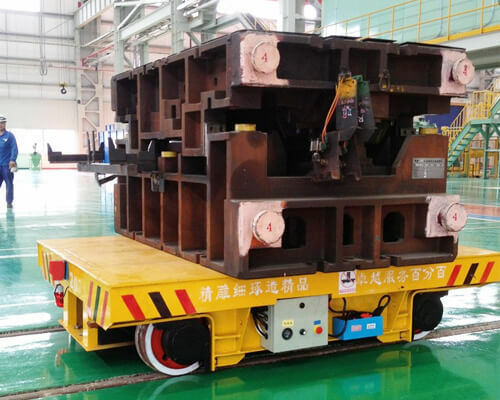 The single-phase low-voltage electric transfer car is ideal for small load transportation, generally less than 50 tons, whereas the three-phase low-voltage cart is more suitable for heavier load handling (typically more than 50 tons) and high frequency of use. The KPX battery powered flat cart is operating on rails. It has excellent safety and flexibility as compared to other KP series products. The battery is installed inside the device, which requires regular maintenance. The battery life is generally around 2.5 years. This device is ideal for low frequency of use and long distance transportation. Two transfer cars can be linked in tandem for higher capacity load or longer objects. We offer custom shaped decks and carts to suit your specific application. Simple structure and low cost make the KPJ series common for load transportation in workshops. 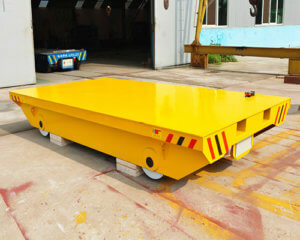 It is a kind of cable-powered transfer cart that is suitable for harsh environments and explosion-proof environments. This device can be designed with any load capacity and high frequency of use. It can also come with lifting system for simple transportation. When the running distance exceeds 50m, a cable guider is required to assist the winding. Generally, the maximum running distance is less than 200m. 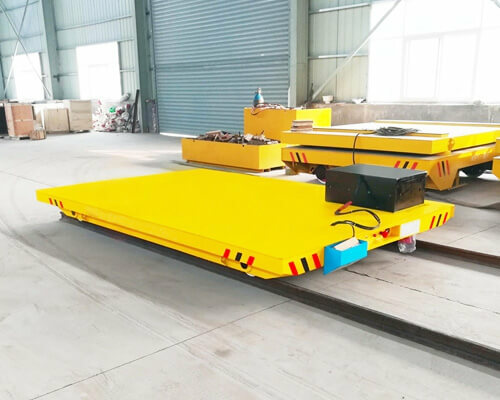 Trackless transport cart is very safe and efficient for moving dies, coils, blanks and other heavy loads throughout the workshops as well as between crane bays. These can move in any direction, typically 360° turning in a small space. It features two-way movement, small turning radius, no damage to the floor and flexible operation. Lifting fixtures are available for simple transportation. Safety equipment options: warning horns, safety beacons, rail sweeps, anti-collisions detection devices, etc. Two carts can be connected together for higher efficiency or longer goods. Our transfer trolley can be designed with the right features and capabilities to make it safe, reliable and adaptable for moving heavy loads throughout your facility. Backed by highly skilled and experienced engineers, we are able to custom design and build the device for your specific load movement requirements. Track, trackless, steering capability, alternative drive and steering system. A variety of control options, including fixed user interface, pendant control and remote control. Variety of safety equipment: warning horns, emergency stop, bumpers, rail sweeps, anti-collision system, etc. You can fill out the contact form on this page or send us an email for more information or for a free quote on any size and configuration transport cart. Cart frame – the frame is box-shaped structure that features high strength, excellent safety, large load capacity, better appearance and easy maintenance. Wheel – the wheel is made of cast steel with polyurethane coating. Deck – stand-off, tilting, flat deck, V-deck, etc. Drive – it utilizes centralized drive or dual drive with soft start motor for smoother operation and safer braking. If you require a safe and efficient material transportation throughout the facility, you can rely on a material handling cart. It helps save time for material delivery, reduce potential damage during transportation with simple load control, excellent visibility of load and maneuverability. It is critical to choose a reliable manufacturer for addressing your material handling needs, improving workflow, productivity and safety. Looking for a trusted manufacturer and supplier? go for Aimix Group. You can learn about how we help you achieve your goals. We offer unique quality carts for years of trouble-free operation. Custom design is available to meet your specific load movement requirements. 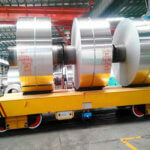 At our company, you can get a cart at a factory price. Perfect after-sales service can help any problem you have in the cart operation. To get the right type of transfer cart for your application, and also at a reasonable price, get in touch with our sales manager today!